Anyone who knows me knows that I can talk ad infinitum about the voice, song, singing, transformation, voicing for social change, how politics is entwined with voice and its history…. But I’m laughing at myself and the hours I’ve managed to spend putting off writing this page. Why the hesitation? It’s partly due to my sense of surprise; how did this happen – that I’m President of this vibrant, active, creative community of voice and singing teachers, serving both art and humanity. And also the problem for me of writing about the voice – what to leave out? I certainly never planned to be a singer or voice teacher. I hoped to follow my artist-trained Mum, but life had other plans. I’ve been registered blind since my 20s, but I’m still intensely visual. For me, singing and the voice are also about pictures, evocations of inner and outer landscapes, ways of painting emotions, moods, stories – so somehow I caught up with those early hopes in a different form. In my early teens, I had a year or two of very tedious piano lessons and then discovered horse riding. I sang in the school choir, sometimes being a soloist, but got kicked out for truanting. In my early twenties, no longer able to read print, I trained as a social worker and worked with blind and visually impaired people, then with street addicts, dissident teenagers, and then as a Trainer and Assertion Teacher. However, at the same time, I turned into a professional singer. From the age of 16, I had been involved with American folk song and blues via the skiffle era. 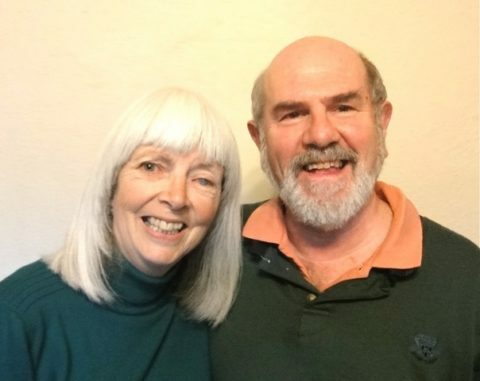 By the early 60s the UK Folk Revival was spreading rapidly, exciting those of us who discovered that the British Isles and Ireland had a wealth of beautiful, powerful, bawdy and funny songs. Researching the songs, studying the melodic and vocal styles, exploring their historical contexts and getting together with like-minded others to perform and record them was a central focus of my life through the 1960s. I was lucky enough to get to know A L Lloyd (Bert) who was a singer and folksong collector. He made BBC radio programmes on international folk virtuosi and shamans, amongst others, and, in 1964, put out recordings he’d made of the Folk Music of Bulgaria and from other parts of the world. The voices that I heard through Bert have never ceased to thrill me to this day; I was hearing singing from these islands (including spine chilling ballads and the waulking songs of the Hebrides), and being thrilled by Bulgarian women’s groups and the amazing range of ways that different cultures harmonise. 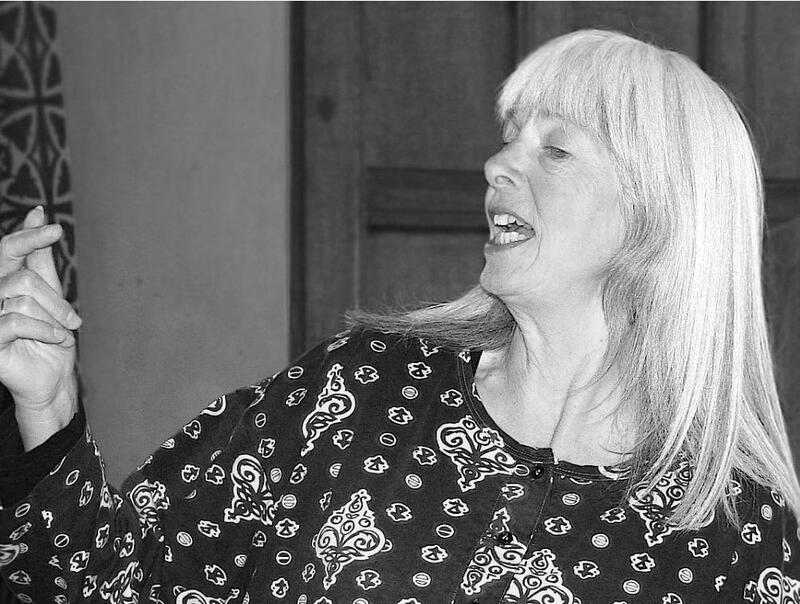 I was also part of a study, performing and theatre group with Ewan MacColl and Peggy Seeger. This helped me develop an equal passion for the songs of the British tradition and for songs that spoke of social and political issues of our day. On a number of singing visits to the US, I went to Ethel Raim’s Eastern European song workshops. And, 42 years ago, in an upstairs pub room in Kings Cross in London, I ran my first voice workshop, based on what I’d learnt from her. I used Ethel’s call-and-response “preparation” for the Bulgarian type voice and then taught some glorious Bulgarian songs. I’d planned this as a one-off event, but my participants said they felt so much more energised that it would help them get through the rest of the week’s work and clamoured to meet again next week. (And the social worker part of me noted how singing together resulted in such a sense of shared warmth and support and increased energy). And so it started, and carried on evolving over three years. In the pub room, we sat on chairs. When we moved to a bare dance studio, it was tiring to stand still and uncomfortable to sit on the floor for lengthy periods. So we started moving as we sang/chanted/called – simulating work movements (doing call-and-response as we ‘worked in the fields’ – hoeing, harvesting, chopping), and adding circle dances and improvised movement. In fact, ‘working in the fields’ became one of the ‘trademarks’ of my approach. Of course, back then, I knew much less about the body/breath/voice relationship, but I saw how doing movement relaxed people, helped them to step around their physical inhibitions about giving voice, and often enhanced the quality of their sound. And this helped open up the potential for vocal improvisation, as well – playing with melody and harmonies, rhythm, imagination, vocal range and quality, mood and expression. Three other important elements emerged for me over this time that have been crucial features in my workshops ever since. Wherever possible, I like to work with the group (including me) in a circle; this creates a great sense of shared experience. It’s also been important to promote a non-judgemental approach; I offered encouragement and helpful suggestions rather than criticising people’s voices. Over the years, many thousands of people have come into workshops saying they couldn’t sing/sing in tune/hold pitch. I discovered that if I began the call-and-response in a made-up gossip language, using distinctively pitched sounds, most people could follow these pitches perfectly because they didn’t think they were ‘singing’. And then, by subtlely sustaining some of these pitches, I could ‘sneak’ in sung sounds until I teased out a whole line of melody from the group. Along with this passion for voice and song came knowledge and experience from working with theatre voice teachers who were developing voice teaching in parallel way for actors. Particularly influential were Cicely Berry (who was then with the RSC), Kristin Linklater who wrote Freeing The Natural Voice and Joan Mills who organised the Giving Voice Festivals/Symposiums from the mid 80s. In the third year of the London workshops, I was asked to train people to run workshops along the lines that I’d developed, so I took on ‘apprentices’ and ran a weekend for singers. I am so grateful for all the reflections, evaluations and discussions we had over those early years. The first formal Voice Leader Training came about through requests in 1988. By then I had worked together for several years with an Australian bodyworker Darien Pritchard. He loved singing and his style of teaching both massage, anatomy and movement was totally congruent with my approach to voice. We have run at least one week-long training course each year since then. Sarah Harman joined us some years ago; she and I are now the primary trainers with Darien as a visiting tutor. The Network itself grew out of a suggestion from one of the trainee groups to hold a reunion and invite those who had been on previous trainings. About 40 of us had a midwinter party – exchanging songs, experiences, ideas and skills – in much the same way that we hope still happens at the Annual Gathering all these decades later. The Network was created by members of that group – establishing the Annual Gathering, setting up the formal organisation and inviting past trainees and other like-minded people to join. 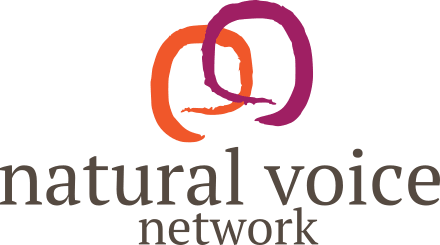 I have enormous gratitude for all the people who have gone on to make what is now the Natural Voice Network a viable organisation. My personal experience of the Network today is that of an extended family. It is rare for a day to go by without my being in contact with at least one member of the Network. It could be an intimate friend or an enquiry about training from a stranger. My contacts now spread far and wide, including Australia, Canada, USA and continental Europe. Indeed, I can’t imagine life now without the NVN. So what do I understand by the term “natural voice”? It’s been said that we don’t just teach singing. For me, the natural voice is an invitation to re-find the voice that, these days, is mostly overlaid with “shoulds”, inhibitions, anxieties, embarrassments and the desire for approval. Too often, these are imposed on us by the competitive and judgemental ways in which music and singing is taught in our culture. So encouraging natural voice is more a “shedding” of the things that get in the way than teaching the “correct” method. The object for me is to help people discover a free, released, expressive, resonant sound through finding relaxation, energy and therefore self-acceptance. Hence, it is about reducing bodily tensions and letting go of the mind’s censorship. Having spent many years listening to and learning from voices of other cultures and song styles, I know that the human voice is one of the most extraordinary, flexible and expressive instruments. To find our own unique instrument and extend its range in every sense is a transformational experience. And, there is ever more to discover in the exploration of the voice and melody. What can “developing good practice” involve for NVN teachers? I want to look at some central elements of the NVN ethos, and what’s distinctive about our approach. I want to offer some thoughts about the implications of our ethos in teaching, and outline some of the relevant skills that I think voice leaders need to develop to deliver these. These skills can be addressed through mentoring and CPD, via the community of practice. At the core of our work is a belief that we are all born with singing as our birthright. Researchers into the origin of voice and singing posit that we humans have been singing for at least 50,000 years. In fact, an Institute of Education report stated that “Music is hard-wired into us”. NVN is part of the movement to return singing to being once again an inclusive rather than exclusive practice – to make it possible for anyone who wishes to sing in a group, regardless of past experience. Part of the social justice ethos of NVN is that people are not born with a belief that they cannot sing! A culture that doesn’t practise inclusive singing is an historical aberration. In order to mirror this in our teaching, it helps to have a non-judgemental approach and give people permission to not have to “get it right”. Working to foster curiosity, and a sense of discovery and exploration helps this. We encourage teaching by ear rather than by using written music to avoid creating a division in groups, and to encourage the development of listening skills. The voice is affected by what we are doing with our bodies. So another key skill is understanding and working with the body/breath/voice interplay. We need to be able to help our groups to understand this by experiencing how tensions and stiffness impact on the voice, and how to release tensions to release the voice. developing one’s own voice as an instrument for both speaking and singing and learning how to keep our instrument healthy, tuned up, flexible, open and enjoyable. Within the NVN we have a wealth of experience, expertise and knowledge to offer professional development on these aspects. There are also many other opportunities, including summer schools and conferences such as Giving Voice and VASTA international conference. I am therefore hopeful that we can all further develop our knowledge and skills to enhance the quality of the work of NVN teachers. The structures of NVN came about when the organisation was much smaller and more homogenous. We need changes to meet the challenge of having grown massively over the past decade. Many of us are concerned to ensure the quality of the work of our members, finding appropriate levels of CPD for the range of members, finding ways of increasing the input from members to the Trustees and of opening up a discussion about who we are, and how we see the future developing. I feel we need as many of you as possible contributing your thoughts. I’m sure I’ll be musing further on these questions while hoping that we hold strongly to our approach and ethos. I’d also like to remind NVN members about the importance of the book by our trustee member Caroline Bithell, “A Different Voice, A Different Song”. I’d suggest that this is essential reading for anyone interested in the development of the Network and community music and also for the stimulating academic chapters on approaching songs of diverse cultures. I have no academic or any other formal training in music, but I found Caroline’s approach accessible and thought-provoking. At present in the Network we are emphasising both our ethos and the value of CPD. Caroline’s book seems to me to provide the fullest route to the root of both the Network and the what, why and how of song. In our groups or choirs it is relatively rare to find people who are confident and comfortable with their singing voices. Depending on the nature of their previous experience, this may or may not mean that they have vocal range, expressive range and flexibility. This results in many participants having quite restricted or non-existent experience with finding out what their voice is capable of – all the possible different timbres, forms of expression and cultural variation. We can use exercises, improvisations, chants and songs to help free the voice and undo old restrictive patterns. In my first workshop ever in 1975, I taught Balkan songs and found that, with suitable preparation, the group could get something of the strong, earthy, resonant sound appropriate for those songs. The following week I thought a good follow-up would be a Wassail song in English that would have been sung outdoors. To my surprise, the strong sound many had achieved at the first workshop was now much thinner and would not have carried any distance. I realised that most people, especially the women (who were the majority), had slipped back into a thin “schoolgirl” quality of sound. However, once I coached them to sing the tune with the Balkan sound using the sound “hey”, the sound emerged with much more strength. Then I added English vowels for them to copy and lastly the words. The sound improved immeasurably. This led me to creating my “trademark” – making up languages and using call-and-response along with rhythmic movement which simulated work actions – hay making, hoeing, grape treading. It was also clear that using songs from a variety of cultures helped in this process – which helped vocal release and varieties of timbre and expression. It can be exciting feeling how varied languages, differing from the “native tongue” that we’re used to, create new resonances and physical sensations. After all, the voice is a very sensual part of ourselves and, when used freely, it gives us the buzz of energy and aliveness that is a large part of the joy of singing.